Prepare to meet your favorite green drink - this pineapple mint green smoothie with green apple, lime and ginger is the most refreshing sip of summer. Add all ingredients to a blender. Blend on high until smooth. Add more non dairy milk if needed to blend. I am an upper-middle class cisgendered white woman, and I want to talk about my privilege. There I said it. But I don’t just want to talk about my privilege, I want to talk more generally about the privilege of wellness. Wellness culture is a thing that began sweeping the nation and with sites like Goop and stores like Moon Juice, there is always a new craze to catch up with. From green juice, to smoothie bowls, to acai, to ashwaganda, the span is wide and, honestly, overwhelming. There are instagram accounts of women vehemently advocating that matcha will change your life. There are companies dedicated to adding special kinds of fat to your coffee. The “wellness” world is endless. I am not immune to this sickness. I have many times thought to myself that one or more of these things would make me healthier or more beautiful – or both. I have put bee pollen on my yogurt. I often scoop collagen powder into my smoothies. And I love me a thick acai bowl. But I know that this level of “wellness” isn’t attainable for the masses. There is a massive wealth gap in this country and minimum wage won’t pay for adaptogens. Admittedly, I am not the first person to go to as an authority on this subject. I was born into a middle-upper class family and I have always lived my life as a white woman. There is so much struggle in the world that I have never experienced. However, I think my gritty, practical southern roots shine through when I am confronted by the wellness culture. Something deep within me screams out about the injustice of this messaging, and wants to do something – anything – to fight back. My reach is small, but here in this space I want to say – health is attainable. 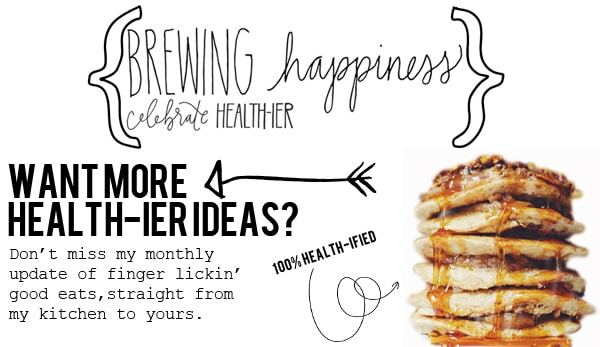 “Wellness” may be a culture for the elite, but here at Brewing Happiness I believe that *health* shouldn’t break the bank. Health shouldn’t feel confusing or expensive or alienating. In the midst of a deeply saddening health coverage bill, I know that these words can sound hollow. But I really think that there is a way to live a *health-ier* life without also having to first win the lottery. There is a version of health that thrives on in season produce, and doesn’t always worry about weather your vegetables are organic or not, because at the end of the day eating a vegetable is better than eating a Big Mac. You catch my drift? I have written a few articles on food budgeting for Mint, a budgeting app, covering topics from groceries, to eating out, to dinner parties. Again, I am no authority figure, but I have done my best to cultivate tips and tricks that will help make healthy food accessible to all. That’s why I create recipes like my 5 Minute Faux Kombucha and I do my best to use ingredients that most everyone can afford. That’s why I love this Pineapple Mint Green Smoothie. The ingredients cost me about $10-$12 dollars and it makes me 3-4 smoothies for the week. Which I recognize would still be too costly if you were on food stamps or struggling to make ends meet. Sadly, I do not have a food/health solution to those problems. I can only do my best to acknowledge the extreme privilege when I see it, and use my resources to create recipes to combat that mentality. Green smoothies aren’t for the rich. They are for you. They are for your health. This smoothie, in fact, is LOADED with nutritional benefits and amazing flavor. It is one small recipe to encourage the separation of true health and “wellness culture.” It is one small voice in a sea of elitism that says, you belong here. You deserve to be healthy. We all do. xoxo. OMG Hayley!! i am stupid obsessed with this smoothie! it’s all i want everyday for breakfast! Thank you for shining a light on this. Healthy eating should be attainable for everyone and there are so many good-for-you real food options that don’t cost an arm and a leg. Yes! So, so much yes. There is so much hype on putting all these adaptogens into your body. I am sure they are amazing for you, but at the end of the day they just aren’t attainable for a regular family. What’s important to most people is getting good food into their family without breaking the bank. YES YES YES. Healthy shouldn’t be for the wealthy exclusively. It’s a ridiculous notion.